I stopped by Merlins Rest the other night, to see how the dinner fare was. Merlins Rest is the owned by Lee Tomlin and in addition Bill Watkins, of the former Molly Quinns is often there as well. Bill’s official title is Minister of Culture, which he embodies whole heartedly. He is the author of three books A Celtic Childhood“, “Scotland is Not for the Squeamish” and “The Once and Future Celt. I first met Bill at Molly Quinns for none other than St Patrick’s day 2003 (or maybe it was 2002.) He immediately welcomed us in and asked us to call him Uncle Bill. Once MQ closed I thought I had lost Uncle Bill forever, that is until I had the good fortune to be invited out for New Years 2010 to Merlin’s Rest . Along with the festivities I was treated to my first Scotch Egg, and quite a bit of fun, but I hadn’t been back until recently for dinner. 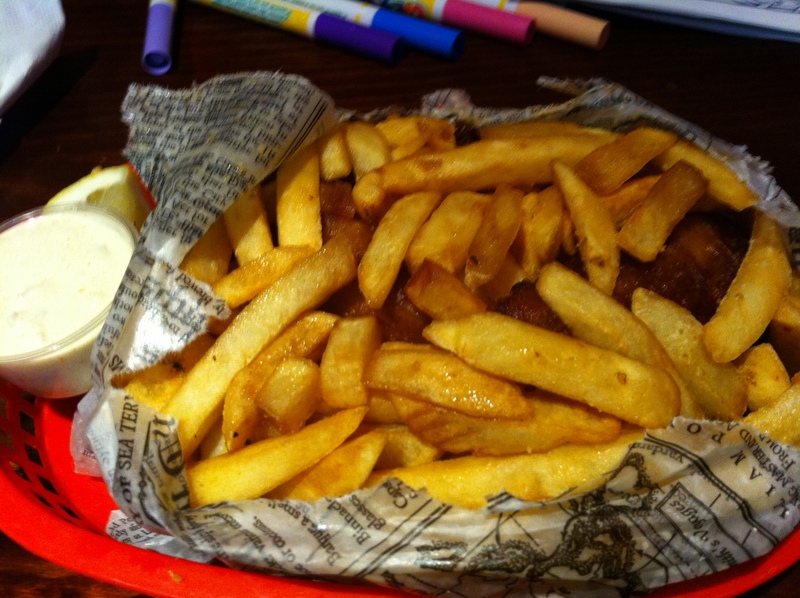 I had heard about the legendary Fish and Chips. (Best in the Cities, probably in the state). Of course I had to try them. I was quite impressed. 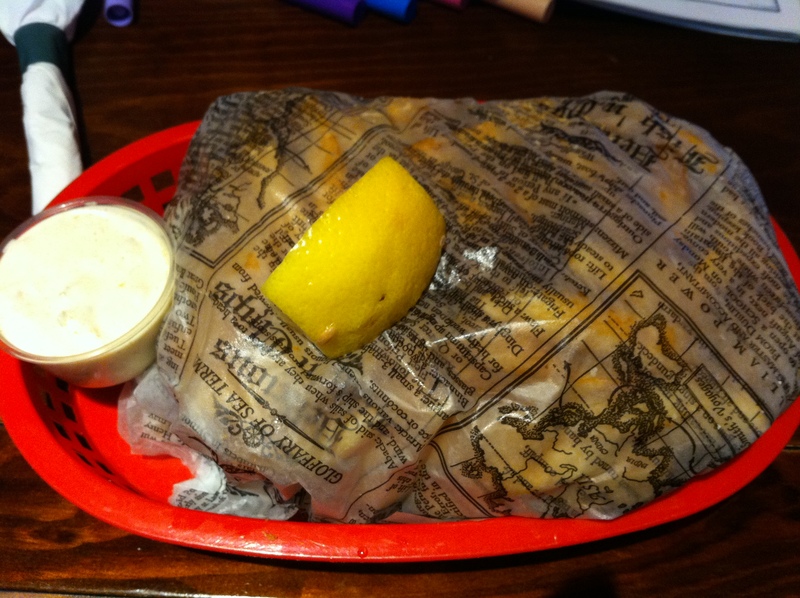 Not that I can say that I’m a fish and chip connoisseur, but these were amazing. They have exactly the right amount of malt vinegar and crunch to them. The batter is delicious and well, the white fish is white fish, but it was cooked well and flakey and delicious. With not even a hint of rubber to them which is often what I find when I’ve ordered fish and chips elsewhere. They also offer a Yankee version, no newsprint, no malt, and no fun, if you ask me. 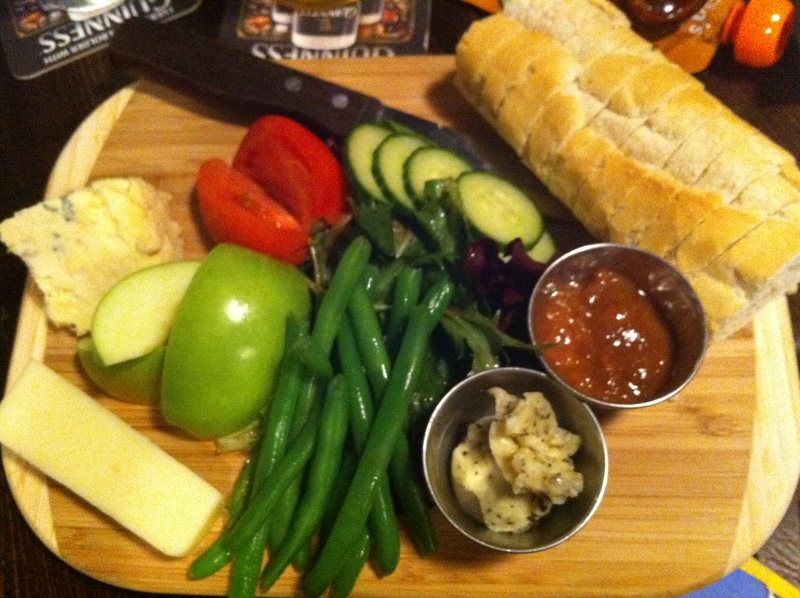 On another visit recently I tried the Ploughman’s with English Stilton which was completely unexpected and fantastic. They vary a bit away from a traditional Ploughman’s Lunch in favor of a much greener, healthier, lighter dish. Additionally there was a HUGE chunk of stilton, so they were already on my good list. As much as I pretend that the bread is part of it, I would happily eat the stilton by the handfuls without any bread or crackers. Oh and I haven’t even mentioned the basil butter, divine!! After a healthy dose of Strongbow (and a Black & Tan for Noah) we enjoyed the splendid English Toffee Cake. My mother tells me this is almost exactly what her grandmother used to make so for her it’s completely nostalgic. For me it was just fantastic. In addition to the food is the weekly live entertainment and trivia. While we were dining there was live music which both my daughters enjoyed dancing to and added to the welcoming ambiance. I wholeheartedly enjoyed my dinner, and maybe if I get brave I may go back to try my hand at some trivia.